President Muhammadu Buhari left Nigeria for New York to attend the General Assembly of the United Nations. The president left the country with his wife, Aisha. 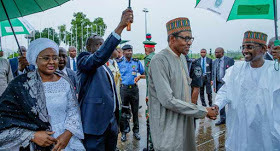 The Special Adviser to the President of Media and Publicity, Mr. Femi Adesina, announced that the President will leave the country today for the event. The 73rd session of the General Assembly of the United Nations (UNGA 73) was officially opened on September 18, 2018 with the theme "Making the United Nations relevant to all people: global leadership and shared responsibilities for peaceful societies , fair and sustainable ". According to Adesina, the highlight of President Buhari's participation will be his speech to the General Assembly on Tuesday.